Card Text Play: Sacrifice a friendly creature. If you do, deal 3 each to 2 creatures. 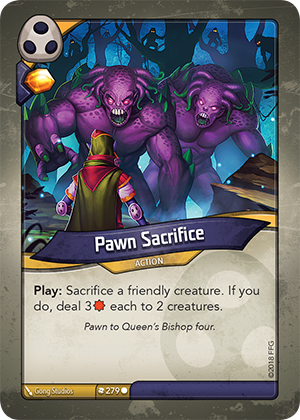 Flavor text Pawn to Queen’s Bishop four. What if there is only one enemy creature I can damage? Then you must deal damage to a friendly creature, if able. Do “Destroyed:” effects trigger when I sacrifice a creature? Yes. When a card is sacrificed, that card is considered to have been destroyed, and any “Destroyed:” abilities the card will resolve.